The other day I was racking my brains for something to buy for my other brother who was turning eight. I contemplated going to K-mart and getting a toy I thought he would like, but I decided against it. 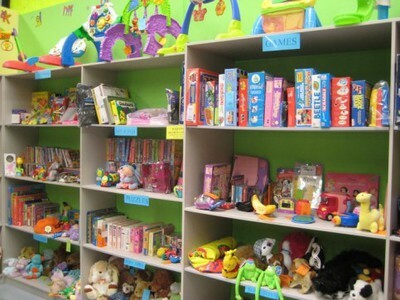 Instead I headed Kids Warehouse which is a second hand, pre-loved, and new baby and kid store. When I first walked in I was so amazed at the brilliant customer service; the boss was helping a couple with a pram that they were buying and I was greeted at very warmly and asked if I needed any help. The shop is so beautifully presented, I could easily find anything I wanted to. I headed straight to the toy section to find something for my brother. All of the boys were organised on shelves according to girls, boys, baby, books and other assortments of items. I found so many second hand items for such a low price. At first I felt a bit apprehensive about purchasing something that was second hand in case it was broken, however the manager informed me that everything was hand selected, serviced and steam cleaned before it was put out onto the floor, so I felt more at ease knowing that. Before choosing something for my brother, I headed into the size 00 clothes bay because I wanted to look for something for my baby cousin as well. The clothes bays had the sizing on the front, and on side was girls clothes and the other side was boys. I even managed to pick up some baby singlets for 50 cents each. I headed back over to the toys and picked up two books, a computer game and a little Bart Simpson toy for under $12. I was extremely impressed with the value. I also noticed there was a playroom available for children who wanted to play rather than shop around. I noticed two little girls sitting quietly and playing on a Mega-Sketcher while the mum was looking at clothes. I was impressed with the amount of stuff the shop had to offer. There was everything a child needed right from birth until they were a teenager. I even found a book for myself, and noticed there was quite a few teenage gadgets such as an iPod dock, school shoes, and books. For anyone that shops at op shops, its always in the back of our mind, "Who used this item before me?" Many op shops don't care what they put out for sale, but Kids Warehouse does. I even noticed the boss was looking through a bag that a lady brought in to sell stuff to the shop, and the boss even had to decline a few shirts because they were crinkled and one had a stain, and she also refused to take a little wooden abacus because the bottom of it was so filthy. Once I was ready to purchase my items, the boss informed me that I could bring in some stuff to sell if there any children clothing/toys/books/dvds/soft toys that was no longer being used, and I would get half of the money for it. I was so intrigued because I knew that my younger siblings still had all of their old toys. I had a great chat to the boss and I felt really happy leaving the store knowing that I had gotten my brother a great birthday present for such a low price, plus the staff there were so friendly, and all of the items are clean and checked so I know that everything will work. I would definitely shop there again. What a Great article,very descriptive,Thankyou for sharing that information,i will be going to the Warehouse now for a look,Thankyou Indigo,it is on my To do list,Regards Katrina. . . . . Thank you dear! Never realised such a place even existed so good to know I have another option of where to take my preloved baby clothes! I will most definitely be visiting this store!